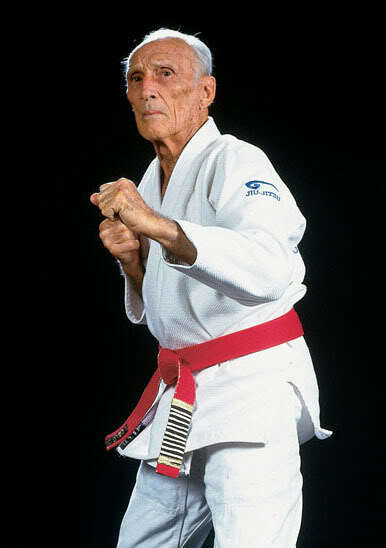 Hélio Gracie (born October 1, 1913) is the co-founder of "Gracie Jiu-Jitsu," also known as Brazilian Jiu-Jitsu (BJJ). Until his death, Gracie was the only living 10th degree master of the discipline and is widely considered as one of the first sports heroes in Brazilian history; he was named Black Belt Magazine's Man of the Year in 1997. In the early 1900's, a Japanese jiu-jitsu instructor by the name of Esai Maeda went to the state of Para in Northern Brazil. There he befriended Gastao Gracie, an influential businessman, who helped the Japanese get established. To show his gratitude, Maeda, also known as "Count Koma," offered to teach the traditional Japanese jiu-jitsu to Gastao's oldest son, Carlos. The youngest son of Gastao and Cesalina Gracie's eight children, Helio, was always a very physically frail child. He would run up a flight of stairs and have fainting spells. Nobody could figure out why. So, after completing second grade, he convinced his mother that he shouldn't go to school anymore. When the family experienced some financial hardships following their move to Rio, some of the children were scattered to live with other relatives. Helio was sent to live with some aunts and through these family contacts, he found work as a coxman for a popular local rowing team, eventually moving into the team dorms. His indomitable spirit, great sense of humor and tireless aptitude to drive people nuts, earned him the nickname of "Caxinguele," which means "squirrel." He raised hell! After a couple of years, when he was about 14, he moved in with his older brothers who lived and taught jiu-jitsu in a house in Botafogo, a borough of Rio de Janeiro. He would spend the next few years limited to only watching his brothers teach, especially Carlos, since doctors had recommended that they keep Helio away from any physical activity. When Hélio Gracie was 16 years old, he found the opportunity to teach a Jiu-Jitsu class, and this experience led him to develop Brazilian Jiu-Jitsu. The Director of the Bank of Brazil, Dr. Mario arrived for class as scheduled. The instructor Carlos was running late and was not present. Hélio offered to begin the class with the man. When the tardy Carlos arrived offering his apologies, the student assured him it was no problem, and actually requested that he be allowed to continue learning with Hélio instead. Carlos agreed to this and Hélio began as an instructor. Hélio realized however, even though he knew the techniques theoretically, in actuality, the moves were much harder to execute. Due to his smaller size, he realized many of the jiu-jitsu moves required brute strength that his physical nature did not allow. He began adapting the moves for his particular physical attributes, and through trial and error learned to maximize leverage, thus minimizing the force that needed to be exerted to execute the move. From these experiments, Gracie Jiu-Jitsu, formally Brazilian Jiu-Jitsu, was created. Using these new techniques, smaller and weaker opponents gained the capability to defend themselves and even defeat much larger opponents. Hélio was arrested and sentenced to two and a half years in jail. An appeal was made to the Supreme Court by Hélio's lawyer Romero Neto and the sentence was upheld, as the court said "Today it was with Manoel Rufini dos Santos. Tomorrow it will be us." A couple of hours after that decision Brazilian President Getúlio Vargas pardoned Hélio. According to Hélio, one of his students had a brother who was an ambassador and was very close to Getúlio, and he intervened in favor of Hélio. Hélio and Getúlio subsequently met many times and Hélio eventually taught Getúlio's son Maneco. Hélio stated in an interview that he had around 15 fights. He began his fight career when he submitted professional boxer Antonio Portugal in 30 seconds in 1932. Also in 1932 he fought American professional wrestler Fred Ebert for fourteen 10 minute rounds until the event was stopped by the police. In 1934 Hélio fought professional wrestler Wladak Zbyszko, who was being billed as a "world champion", for three 10 minute rounds. That match was declared a draw. Hélio did win against Taro Miyake, a Japanese professional wrestler who worked for Ed "Strangler" Lewis in the U.S.
Hélio also fought in Brazilian Jiu-Jitsu vs. Judo matches. In 1932 he fought Japanese judoka Namiki. The fight ended in a draw, but according to the Gracies the bell rang just seconds before Namiki would have tapped out. Hélio had two fights with Japanese judoka Yasuichi Ono after Ono choked out Hélio's brother George Gracie in a match. Both fights ended in a draw. Hélio fought another Japanese judoka Kato twice. The first time was at Maracanã stadium and they went to a draw. Afterwards, Hélio asked for a rematch. The rematch was held at Ibirapuera Stadium in São Paulo and Hélio won by front choke from the guard. In 1955, Hélio went on to fight leading judoka Masahiko Kimura at Maracanã stadium with Kimura winning via bent arm lock. In 1994, Hélio admitted in an interview that he had in fact been choked unconscious earlier in the match, but had revived and continued fighting. In 1967, during a live television interview, Helio was challenged by capoeira practitioner Valdomiro. Helio, as always, accepted the challenge and defeated him via back choke on a live television program called "Desafio 67" that took place one week after the challenge was made. In May 1955 at the YMCA in Rio de Janeiro, Gracie participated in a 3 hour 40 minute fight against his former student Valdemar Santana, with Gracie losing by technical knockout due to exhaustion. It is often claimed that that fight is the longest fight in history; however, that distinction belongs to a wrestling match at 1912 Olympics that lasted 11 hours and 40 minutes. Helio, the first sports hero in Brazilian history, also challenged boxing icons Primo Carnera, Joe Louis and Ezzard Charles. They all declined. Outside of the ring, always looking for a challenge, he enjoyed breaking wild horses and bulls. In an event worthy of a Hollywood movie, he once jumped into shark infested waters in the Atlantic Ocean to save a man's life, which earned him a medal of honor. Helio's relentless contribution to the perfection of jiu-jitsu techniques, his philosophy on life and his unique teaching methodology have been an example for his children and his students worldwide. These are the pillars on which the Gracie Jiu-Jitsu Academy was built. Gracie had been married twice, first to Margarida and later to Vera. He has 7 sons (Rickson, Royler, Rolker, Royce, Relson, Robin and Rorion) and two daughters (Rerika and Ricci). The 95 year old patriarch of the Gracie family died on the morning of January 29, 2009 in his sleep in Itaipava, Rio de Janeiro. The cause of death, reported by the family, was natural causes. He had been having stomach problems a few days before when he was admitted to a local hospital in Rio de Janeiro. "I created a flag from the sport’s dignity. I oversee the name of my family with affection and nerves of blood," were his last words. NEWS: Is It Curtains for Cursive Writing? Happy Lunar New Year 2009!